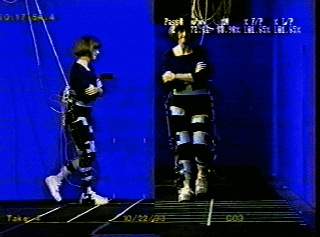 Preface: The main focus of this investigation is the development of quantitative measures to assess the dynamic stability of human locomotion. The analytical methodology is based on Floquet theory, which was developed to investigate the stability of nonlinear oscillators. Here the basic approach is modified such that it accommodates the study of the complex dynamics of human locomotion and differences among various individuals. Approach: An experimental study was conducted to assess gait kinematics and dynamics of polio survivors utilizing newly developed graphical and analytical tools. Phase plane portraits and first return maps were used as graphical tools to detect abnormal patterns in the sagittal kinematics of polio gait. Two new scalar measures were introduced to assess the bilateral kinematic symmetry and dynamic stability of human locomotion. Experimental study: Nine healthy subjects and seventeen polio patients were involved in the project. Significant increases in the knee extension and ankle plantar flexion of polio patients were observed during the weight acceptance phases of their gait. Polio patients also exhibited highly noticeable excessive hip flexion during the late swing phase of their ambulation. Results: Using the proposed symmetry measure, we concluded that polio patients walked less symmetrically than normal subjects. Our conclusion, however, was based on the bilateral symmetry in the sagittal plane only. Finally, we observed that polio patients walked significantly less stably than normal subjects. In addition, weaknesses in lower extremity muscles of polio patients were found to be an important factor that affected stable ambulation.